Thelma B. James, age 80, of Pevely, MO and formerly of Lutesville, MO died Friday August 17, 2007 at the St. Anthony Hospital in St. Louis, MO. She was born July 10, 1927 at Sturdivant, MO daughter of James Hardin and Elizabeth Fisher Walker. 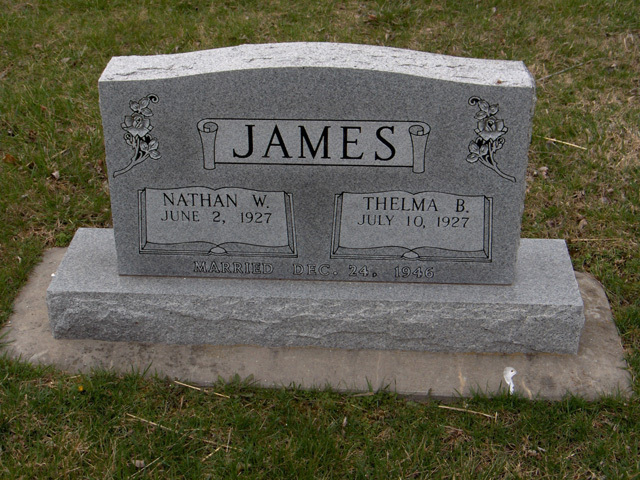 She and Nathan James were married December 24, 1946 in Lutesville, MO. Mrs. James worked as a cook for Dohacks, a welder for E. H. Barry and was a member of the First Baptist Church in Arnold, MO. Survivors include; her husband Nathan, four daughters, Bonnie Basden and Shelby Hogan both of Arnold, MO, Helen Hamlyn of Imperial, MO, Linda Harmon of Sullivan, MO twelve grandchildren and sixteen great grandchildren. She was preceded in death by her parents, four brothers and four sisters. Visitation will be Monday, August 20, 2007 from 12:00 noon to 2:00 PM at the Liley Funeral Home in Marble Hill. The funeral service will be Monday, August 20, 2007 at 2:00 PM at the funeral home chapel with the Rev. Mink Ferguson and Rev. Kenny Qualls officiating; burial will follow in the Bollinger County Memorial Park Cemetery near Marble Hill.